It was an eventful and stressful weekend. Let me confess: There is a sense of loss that is ever-present in my life since my father passed away after a very short illness early 2007. A blog entry is hardly the place to spill emotional beans, but some do say it is therapeutic, so allow me a moment. 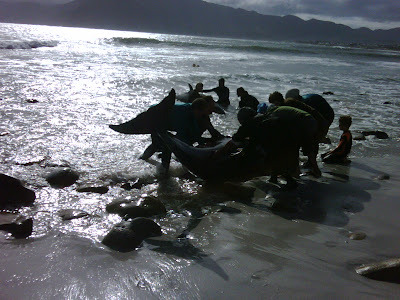 The beaching of 55 fake killer whales on our Kommetjie beach early yesterday hit me hard and going through the experience of loosing them after trying to save them untied some knots in my mind and heart. Emotionally, it was a paralysing moment ending in grief and trauma - especially for the children that were there! I wish the authorities dealt with the entire situation differently as suggested on BBC by another volunteer helping with the effort. It also makes me wonder about Cape Town's abilities to deal with crowds ahead of the WorldCup Soccer 2010. In the end, we all had to walk away and I returned with a dear friend returned later on Sunday and it was as if nothing has ever happened on the stretch of white sand. It made me think again about life and how it simply moves onwards - even after an incident or crisis. We need to keep perspective - even in a moment of sheer emotion. And it is not always easy, but there is ALWAYS another angle to the same experience, as is clear from the write-up from 6000 Miles on the entire incident. We need to hold on to our memories and wrap them like small blankets around us. There are memorials yes, and there are gravestones and memories in photo albums that tie us to people, pets and places. However, ultimately, it is the only the altered way in which experiences of gain and loss shape us (and our moulded perception of the world) that remain. Today, I think of a school friend of mine who lost her two children two weeks ago in a terrible accident when her husband ran them over on the farm as they fell from the car. And I can not even start to imagine their heart ache and loss. And maybe we can only hope that grief do not die. I can never understand how people are expected to 'just go on with life' when life itself is no longer what you know. For me, it all changed when my dad passed on... and life is altered a bit again with every new loss, even when whales strand on the beach where I walk my dogs every day. No grief of mine should ever pass away. Loss of love, loss of life, loss of possession, loss of strife. Loss of direction, loss of breath, loss of water, slow slow death. I took a trip some time ago to think about life. It made me think that as an especially gifted species, we are able to piece together a series of activities in the short-and-long-terms that ultimately end. With some luck, these endings have positive results - a nice legacy. Sometimes the end is handed to us in a permanent fashion, other times we wrap up and move on to something else. The respect we give to beings' legacies, the end of their activities, speaks volumes on behalf of our hearts and their efforts, intentions or simply their existence. As tragic as this story is today, we should all be lucky enough to know life this way - and to be able to share with our friends and passersby as we go about our own activities. Thanks for sharing these stories, Ally.